This Dermalogica Skin Kit contains a full regimen of what your skin needs most. If you are a first time Dermalogica user then prepare yourself for great skin. And if you are already hooked, these convienient travel sizes will bring professional skin care whereever you are going today. Use as directed by your Dermalogica Professional Skin Therapist. 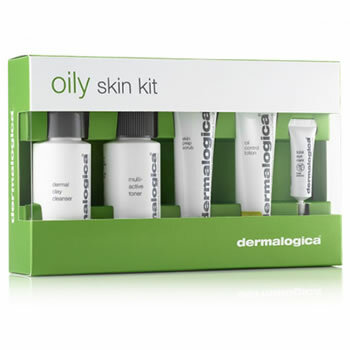 Dermalogica Skin Kit Oily Contains: Dermal Clay Cleanser (absorbing, refining cleanser), Skin Prep Scrub (skin-polishing exfoliant), Multi-Active Toner (hydrating, refreshing spritz), Oil Control Lotion (oil-absorbing moisturizer) and Total Eye Care with SPF15 (illuminating eye brightener).